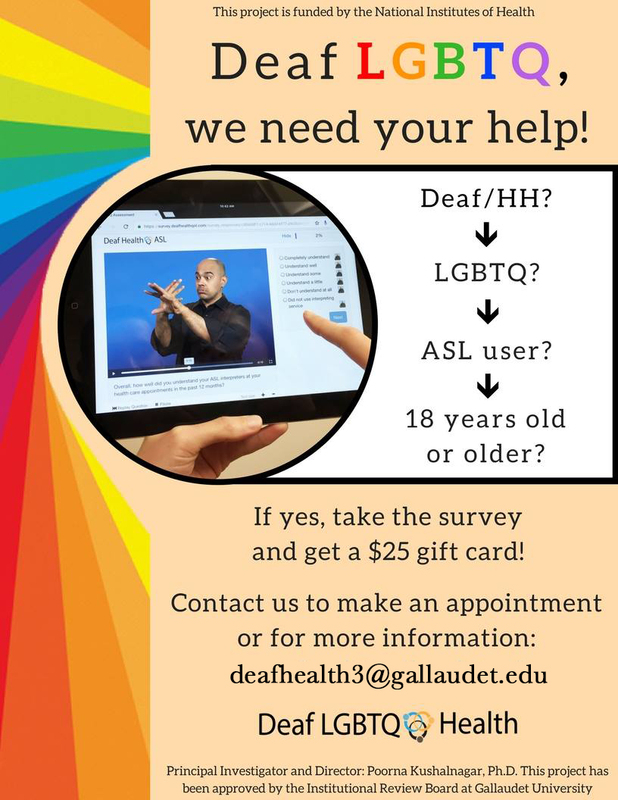 Deaf LGBTQ+ Health Survey: We need YOU! Deaf/hard of hearing people who identify as lesbian, gay, bisexual, transgender, queer, and asexual – YOU are invited to take a health survey in ASL and English (http://www.deafhealthqol.com/lgbt). This project is funded by the National Institute of Health that was awarded to P. Kushalnagar at the Deaf Health Communication and Quality of Life Center at Gallaudet University. Please take a look at the flyer and contact Bethany at [email protected] for more information! [This flyer has an orange background with several words and images. Black font: we need your help! Black font on the right center: Deaf/HH? Black font on the right center: LGBTQA+? Black font on the right center: ASL user? Black font on the right center: 18 years old or older? Black font: If yes, take the survey and get a $25 gift card!